I’m not super big into going over the top for holidays. We don’t do gifts or baskets on Easter or Valentine’s Day. 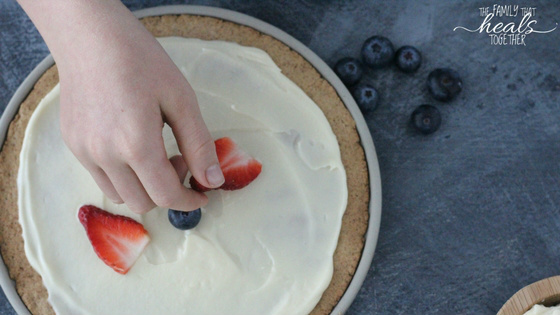 But I do love an excuse to whip up something special in the kitchen, so for Valentine’s Day last week, I transformed my cassava sugar cookies into this grain-free sugar cookie fruit pizza. Let’s just say the crowd went wild. We ate it for breakfast because it has fruit on it, which makes it healthy. 😉 I mean, the fruit was organic. 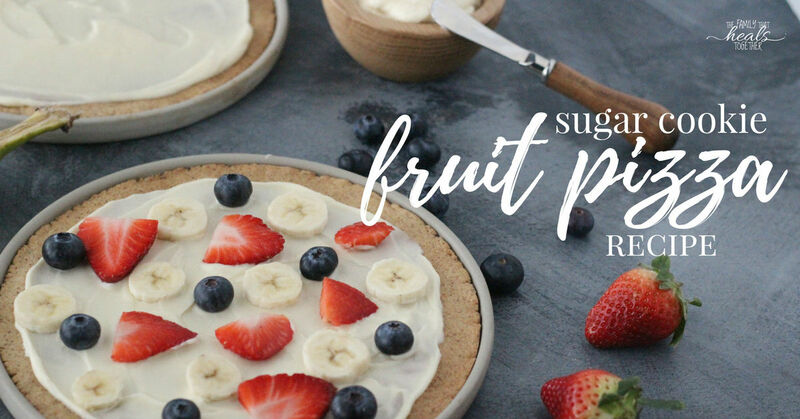 So… *sugar* cookie fruit pizza? I really love the maple sugar in this recipe. Maple sugar is less refined than white sugar and offers some trace minerals. And it totally behaves like real sugar in recipes. But honestly? It’s still sugar. I buy one small bag of it from time to time from Thrive Market and when it’s gone, it’s gone til I get around to ordering again, and I don’t order it every time. What I do order every time? These maple bacon pork skin cracklings for Mr. Incredible. 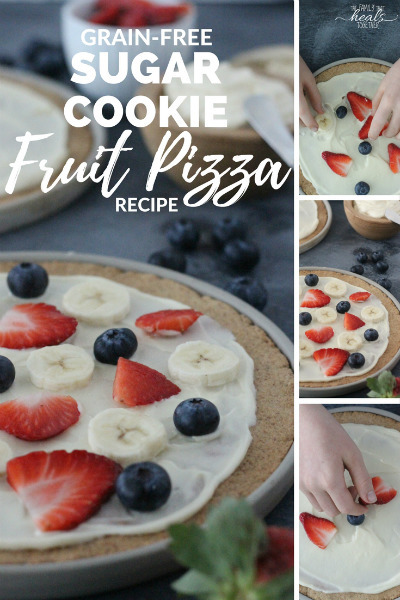 For the same reason I make this sugar cookie fruit pizza for my boys. I like to make their tummies happy. 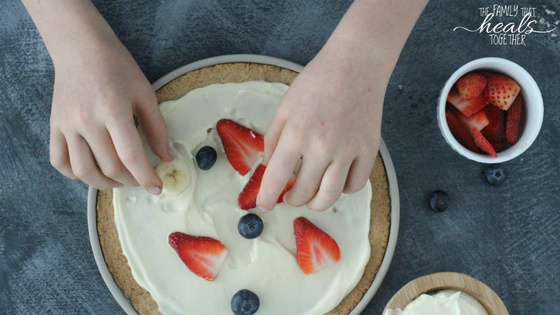 If you want to make your kiddos’ tummies happy, I suggest you make this sugar cookie fruit pizza. It’s free from junkie ingredients and it’s gluten and grain-free. Grab the recipe below, then make it next time your sweet angels deserve a really special treat… or the next time they’ve been insane and mama needs a treat. Either way is justification for this yummy goodness. In a large bowl, beat the ghee on high with a hand mixer, until creamy. Add the maple sugar and baking soda and beat once more until combined, scraping the sides to mix well. Add the flour and mix with a rubber spatula until mostly combined, then finish mixing with the hand mixer. Line 2 small or one large pizza pan with parchment paper (don't skip this part). Either divide the dough into two parts and roll onto two pizza pans, or roll out the dough onto one large pizza pan, using a rolling pin, to about 1/4" thickness. Bake for 10-12 minutes, until lightly golden, then remove and allow to cool. Meanwhile, prepare your frosting: combine ingredients in a large bowl and mix on high with a hand mixer until smooth. Slice your fruit and set aside. Once cooled, frost your sugar cookie crust(s) and top with fruit slices. Slice up like a pizza and enjoy! Getting to help decorate will be your kids’ favorite part!